I don’t normally blog about political issues, but I’ve noticed an interesting political phenomenon that is connected to entrepreneurship, which is one of my research areas. We are currently in the middle of the elections for the European Parliament. People all over the continent are due to vote just five days. Recent polls have shown that a brand-new political party called the United Kingdom Independence Party (UKIP) may capture the largest number of UK seats in the EU parliament. 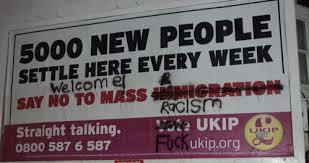 UKIP has attracted many voters. 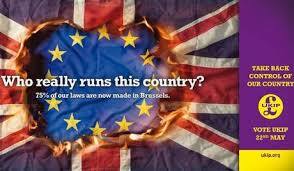 Many people are supporting UKIP essentially as a protest vote against the three main parties. Such voters may know little about UKIP’s actual policies. UKIP favours the immediate withdrawal of the UK from the EU and a dramatic reduction in the number of immigrants admitted each year. Neither Euroscepticism nor opposition to mass immigration is a position that can be associated with either the left or the right of the political spectrum, as all of the major political parties have, historically, been divided by these issues. UKIP’s economic philosophy is staunchly libertarian: it favours big tax cuts, the end to many environmental regulations, and a generally business-friendly environment. Opponents have, of course, attempted to label UKIP as racist. Although a few racists have joined the organization, that particular charge is basically unfair. UKIP has much more in common with the US Tea Party movement than with white supremacist political parties of continental Europe. Many small businesses, at least near me, appear to be sporting UKIP signs. I’ve noticed that most of the businesses with UKIP signs are small, inefficient, obsolete, dingy-looking and run by elderly white men. A case in point would a toy shop near by house. It has a single worker (the elderly owner) and is almost impassible because of the boxes of old toys on the floor. It is dark and crowded. Many of the toys are in boxes that look old and certainly sun-faded (red ink has turned to a faint pink, etc). The owner of this shop handed me a UKIP lealflet that attacked immigration from Eastern Europe. Please note that the photo below is of another business that supports UKIP. 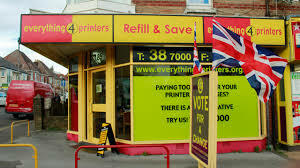 This shop appears to specialise in refilling printer cartridges, an activity that likely reduces the profits of the large US and Asian companies that manufacture printers. Businesses such as my local toy store are relics of yesteryear and are precisely the type of firm that would benefit from protectionism. Given that economic actors and businesses models from outside of the UK, such as US-style Big Box stores have deciminated such small businesses, one can understand why such business owners would favour a political party the combines protectionism with (internal) laissez-faire. It is true that a future UKIP government would never pass a law restricting Toys R Us or Amazon from competing against dumpy little toy shops. Such a law would be anathema to the laissez-faire ideology of the Anglo-American right. (In other parts of the world, most notably Japan and France, centre-right political parties have built electoral coalitions by supporting laws designed to protect small retailers from big chains). While UKIP wouldn’t pass a law modelled on Japan’s infamous Large Scale Retail Store Law, it might keep a young and ambitious migrant from the EU from opening a clean and colourful toy shop. Moreover, it would cut taxes and eliminate environmental regulations and the minimum wage, which would help this type of marginal business to survive. My experience shopping in businesses with UKIP signs over the last two weeks has been uniformly negative, and not because of the signs. UKIP appears to attract a type of pennywise and poundfoolish businessman who competes the using materials of the lowest cost. Last night I stayed in a bed and breakfast that appears to be owned by a UKIP supporter. Shortly before going to bed, I popped into the bar, where the owner of the business was lecturing a guest about the reasons to vote UKIP. I noticed that soap in our room was of the cheapest type. The television in the room was tiny and had very poor image quality. Breakfast was made with cheap ingredients. I’m not complaining because I selected this B&B precisely because it was cheap and I just needed a place to sleep. I’ve been to other B&B where only the finest foods were served at breakfast. Each type of B&B has its time and place. My brief experience with this B&B got me thinking about the relationship between the personality traits of different types of entrepreneurs and the relationship between their business strategies and political proclivities. This relationship is certainly something an economic sociologist might wish to investigate. My experience based on a tiny sample size suggests that people who compete by cutting their costs to the bone might be more inclined to vote UKIP than entrepreneurs who compete at a different end of the market. I suspect that the owners of a B&B would buy the ingredients for breakfast at Waitrose would be less likely to vote UKIP. It also occurred to me that UKIP signs in businesses might provide useful information to consumers, even those who don’t care about politics. In North America, there is a voluntary certification programme for small companies called the Better Business Bureau (BBB). If a company meets their minimum standards, it can put a BBB sticker in the window. This certification reassures customers and can help develop a firm’s brand. It seems to me that a UKIP sign on a business might serve a similar function. I’m not suggesting that consumers boycott UKIP-supporting firms. Far from it. However, people who are willing to pay a bit more for quality, the Waitrose Shoppers as it were, might wish to avoid a pro-UKIP firm. On the other hand, customers who want the cheap and cheerful experience may wish to gravitate to this sort of business. I should point out that I don’t have strong views about politics in the UK or any other jurisdiction. I’m too transnational for that. Let me also stress that I love entrepreneurship and admire many types of entrepreneurs. However, the term “entrepreneur” embraces a vast range of businesspeople who cater to customers with very heterogeneous preferences. Political affiliation may be a useful signal for consumers in the UK and other countries.